What is allogeneic stem cell transplantation? What is an allogeneic stem cell transplantation? Autologous stem cell transplantation may be used as a consolidation therapy. However, allogeneic stem cell transplantation is considered to be the best curative treatment option for some AML patients. How does allogeneic stem cell transplantation differ from autologous stem cell transplantation? There are two main types of stem cell transplants – allogeneic and autologous. An allogeneic stem cell transplant is a procedure in which a patient receives blood-forming stem cells from a donor. In contrast, for an autologous stem cell transplant, the patient provides his own stem cells for the procedure. 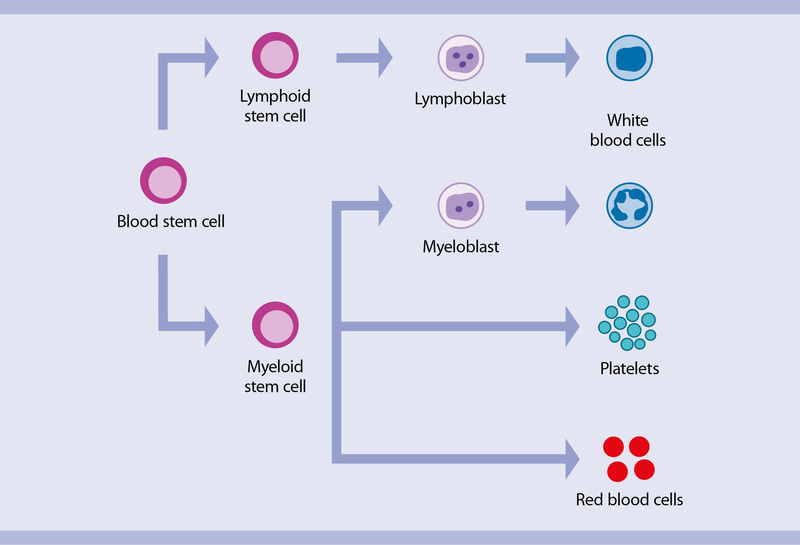 Blood stem cells collected from the patient while he is in remission are stored and then returned following conditioning chemotherapy or radiation. Why allogeneic stem cell transplantation? Therefore, the first goal of allogeneic stem cell transplantation is to replace the patient’s blood and immune system with a healthy one from a donor. The second goal and major advantage of this approach is that newly generated immune cells attack residual leukemic cells, called the graft-versus-leukemia (GvL) effect. This makes the disease less likely to return. Overview of the process for allogeneic stem cell transplantion. In an allogeneic stem cell transplant, stem cells are donated by a healthy individual whose tissue and blood cell type are compatible to the patient. Frequently, the donor is a sibling with an identical tissue type. Other immediate family members can also serve as stem cell donors. 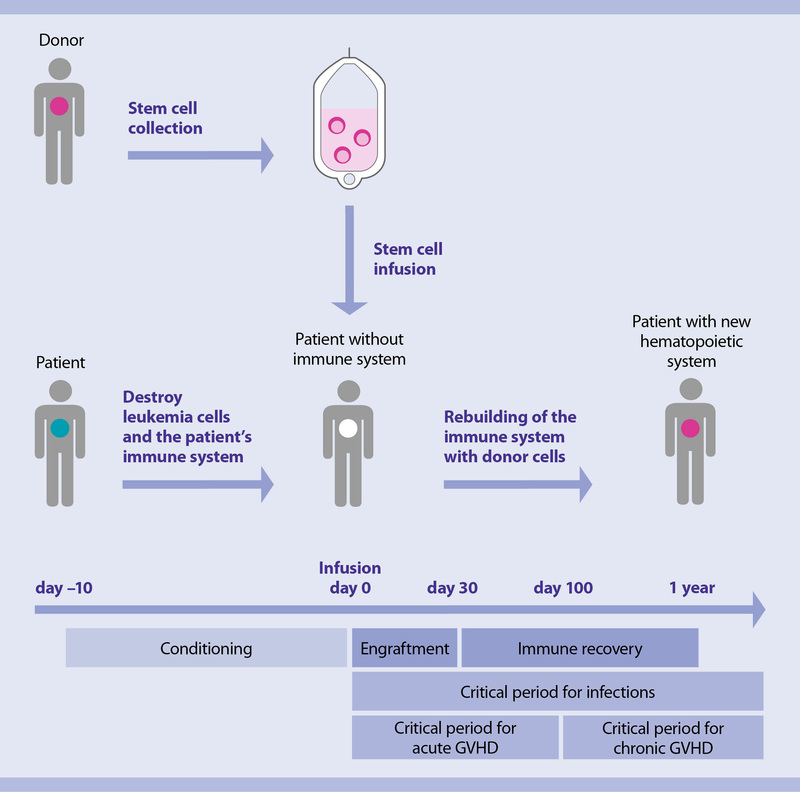 Overview of the process for allogeneic stem cell transplantation. Why are stem cells transplanted? Our blood cells develop from a small number of precursor bone marrow cells called blood stem cells. These stem cells have not committed to a specific blood cell type. Blood stem cells will develop into white blood cells, red blood cells, or platelets in the presence of specific chemical signals. White blood cells are cells of the immune system with the function to fight infections caused by bacteria, viruses, and fungi. Platelets, also called thrombocytes, are pieces of cells that seal damaged blood vessels and help blood to clot. Both functions are important in stopping bleeding. Following a successful stem cell transplant, the bone marrow is repopulated with blood stem cells from the healthy donor, which will rebuild the patient’s blood and immune systems. This step is critical for the effective treatment of AML. Blood cell development. A blood stem cell goes through several steps to become a white blood cell, platelet, or red blood cell.